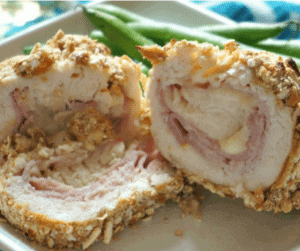 Pretzel Crusted Chicken Cordon Bleu: A twist on a classic dish. Tender chicken, savory ham, and sharp cheese all rolled up in a crusty salty pretzel crust. Served with a mustard wine sauce for your dipping pleasure. My son has become quite the foodie. Or so he thinks. I have to laugh at some of his creations he comes up with while watching Chopped with me. They can be downright scary! Not to mention his birthday request last year–A Ravioli Pizza. Usually he wants Ravioli Lasagna which I am all for, but this was a bit odd. It worked but in such an odd way. And of course was carb overload! The other day, he mentioned again how much he loves my Quick Low Carb Chicken Cordon Bleu. And then he proceeded to go into the fridge and point out we had everything we needed to make it. Why yes, we did–great minds think alike, I had my easy baked Chicken Cordon Bleu planned for that week. So I asked him if he wanted to make it himself, to which he agreed. However, as he was setting up ingredients he walked out of the pantry asking if we could actually bread the chicken cordon bleu with pretzels. Totally genius!! Ham and pretzels go together like peanut butter and chocolate in my book! And at this moment, I so was claiming him as mine! So I helped me son create his masterpiece. We worked together–wrapping ham and cheese up in chicken and then dipping into flour, an egg wash, and finally crushed pretzels. It was fun and we were certainly rewarded when we sat down to eat this meal. Place each chicken breast between 2 plastic wrap or inside a large freezer safe ziploc bag with 1 teaspoon water. Top each chicken breast half with 1 slice ham and a slice of Swiss cheese. Fold the chicken breast in half, pinching edges together to seal, or use toothpicks to seal. Set out 3 plates or pie dish. On one plate, place seasoned with salt and pepper. In second pie dish, whisk eggs with a bit of water and a pinch of salt and pepper. In third pie dish, place your crushed pretzels (or whatever you are using to bread your chicken). Dip each chicken breast into the flour and coat on both sides, then the egg mixture, then the pretzels. 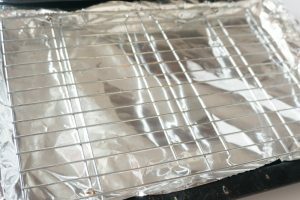 On top of the foil, place a oven safe metal cooling rack that fits on tray nicely. Place chicken on the rack and bake. The rack allows air to circulate around the entire chicken breast, keeping the breading nice and crispy. 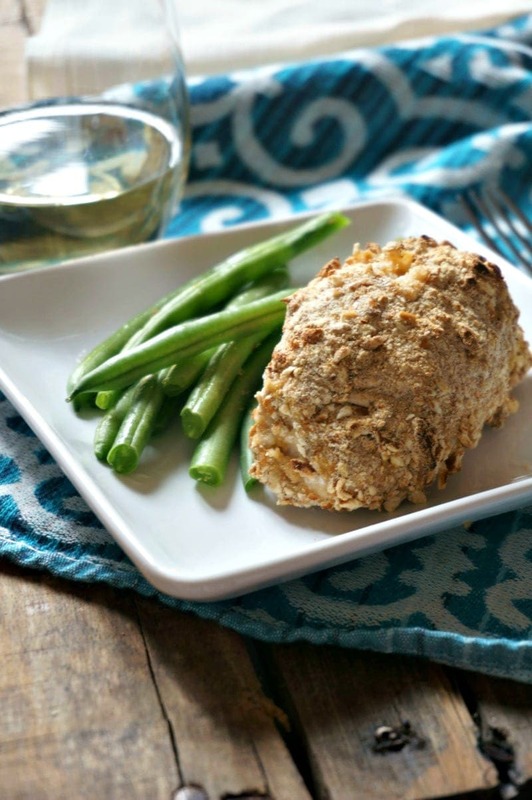 I have to say this pretzel crusted chicken was certainly a winner with everyone in our house! And while it shone on its own, I decided to pair this Pretzel Crusted Chicken Cordon Bleu with a mustard sauce–because, you know, mustard and pretzels and ham–WOW!! It is simply, reduced dry white wine and chicken stock with a bit of mustard and cornstarch whisked in–simple, yet impressive. The mustard sauce took this dish from WOW to restaurant worthy! I guess the moral of the story is to get your kids into the kitchen–sometimes their ideas are going to be insane, but other times they may surprise you with something incredible. Either way, you make great memories! I ended up with a great dinner and a special moment with my son! 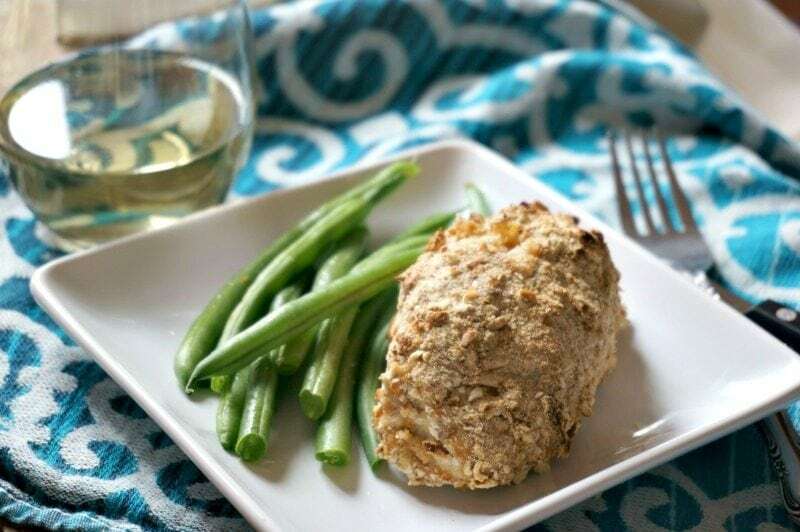 This stuffed chicken breast recipe is a great time to use leftover ham. If you don’t want to stuff your chicken, pretzel crusted chicken is just as delicious and pretzel coated chicken cordon blue. A great hack for stuffing chicken, the lazy way, is to cut a slit in each chicken breast lengthwise, and stuff the slit with a piece of ham and cheese and then dip in breading mixture. Not as pretty, but so easy! Be sure to remove toothpicks if you used them before serving this stuffed chicken breast recipe. If you don’t want to use pretzels as your crust, panko or plain bread crumbs work as well. To reheat leftover, place on cookie sheet and bake in oven at 350 degrees for 15-20 minutes, or until warmed through. If you try to microwave breaded chicken, it will get soggy. This Pretzel Crusted Chicken is delicious served with Sweet and Spicy Green Beans and French Potato Gratin. 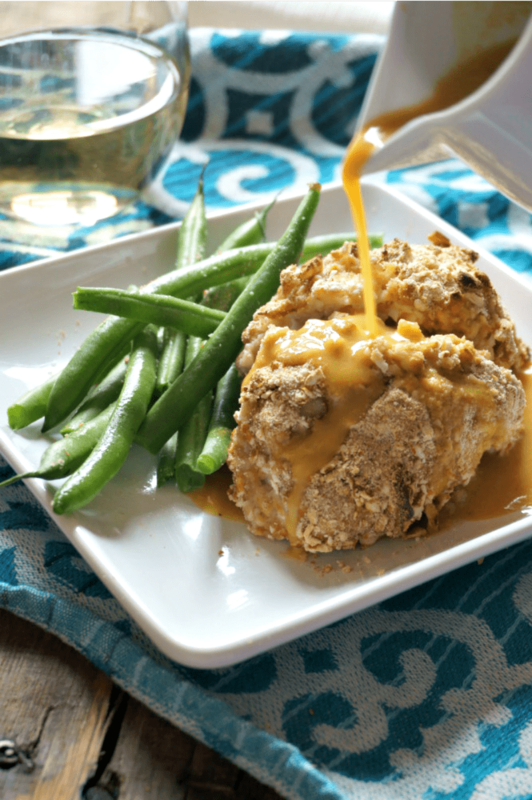 Ham and cheese are stuffed inside a chicken breast that is coated with pretzels and served with a mustard sauce. Preheat oven to 400 degrees. Place wire rack on cookie sheet. Pound chicken breasts out until 1/4 inch thick. Place a piece of ham and cheese on each piece of chicken. Roll up and secure with a toothpick or two. Set up a breading station. One bowl has flour mixed with salt and pepper, next bowl has egg whisked up with 2 tablespoons water, and final bowl has crushed up pretzels. Bread each chicken packet by dredging in flour, dipping in egg wash, and then finally rolling in pretzels. Place on cooking rack on cookie sheet. While chicken is baking, whisk together mustard, wine, chicken stock, and onion powder together with a bit of salt and pepper. Bring to a boil, and simmer until chicken is cooked. The sauce will be thin, but that is how I like it. Feel free to thicken it up with 2-3 teaspoons of cornstarch. I love Cordon Bleu! The pretzel crust really makes my mouth water too. Ha. Ha. I would eat this anytime as well. Oh man, you had me at pretzel crust, but that sauce! Yum! What a fun idea and sounds tasty as well. Don’t you love kids getting in to food? THey are so naturally creative and sometimes it works like here! I love chicken Cordon Bleu too! My son is in culinary school and he is learning tons of sauces right now. I am going to share this with him! I hope he enjoys this one Analida! What a great idea he had, crispy pretzels on the outside, creamy cheesy on the inside. Looks like the perfect comfort food dish! I love chicken cordon bleu! My Mom always made it when I was growing up! Yours looks absolutely amazing! This looks amazing! I love the pretzel crust! Your son is quite the Foodie indeed! Guess he takes after his mom 🙂 The pretzel crust is genius – and I love that you paired it with that mustard sauce! Such a delicious dinner idea! I love that your son came up with this idea!! Never would have thought to use pretzels to bread the chicken! Thanks Ashley. The pretzels add such a great flavor to this classic dish!